Harrogate Town Ladies took another big scalp as they progressed into the semi-finals of the West Riding County Cup on Sunday afternoon. Jon Maloney's side, conquerors of Bradford City in the previous round, saw off Leeds United Reserves by a 4-1 scoreline at the CNG Stadium. "I'm really pleased, this is an excellent result against another good side," boss Maloney said. 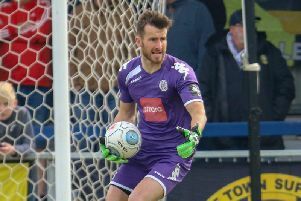 "It comes off the back of a league win against Hartlepool United last week and after a run of good results we wanted to keep that momentum going. "Leeds fielded quite a young team and we were able to dominate them physically as well as playing some really good football. "We were on top from the first whistle and Sophie Tinson took her chances extremely well once again. "This is the furthest we've ever been in the competition and it's great to see the girls making history for the club." Tinson, Town's leading scorer, was narrowly wide of the mark with an early chance however she broke the deadlock after a quarter of an hour, running onto a through-ball and finishing into the bottom corner. The home lead was then doubled seven minutes before the interval, left-back Becky Davies starting and then finishing a fine team goal that featured numerous passes and useful contributions from both Tinson and Grace Adams. Leeds did manage to pull one back early in the second period, though Tinson's second of the afternoon arrived after 70 minutes to restore the hosts' two-goal cushion. The striker was fed by Davies just inside the penalty area, swivelling and firing home before completing her hat-trick soon afterwards when substitute Ellie Randall teed her up. Awaiting Maloney and his players in the last four of the competition are Brighouse Town Ladies, an established FA Women's National League North outfit. They play their football a tier higher than Harrogate, but having already upset Bradford City - a side who operate two divisions further up the pyramid - Maloney says his charges have nothing to fear. "There's no pressure on us, we'll just look to go and play our football and try and upset the odds," he added. "Brighouse are strong. They've narrowly missed out on promotion from the division above a couple of times in recent years and I expect they'll be better than Bradford were, but we're really looking forward to the challenge." Next up for Town Ladies is a league clash with South Shields at the CNG Stadium on Sunday, 2pm kick-off.